Vitamin B17: Able to Treat and Prevent Cancer, or Pure Poison? So, you’ve heard of B6, B12, and even B-complex vitamins, but likely not vitamin B17. This powerful vitamin substance shown to halt cancer has also been called poison. So which is it: a natural treatment, or ‘quackery’? Vitamin B17 is patented in the U.S. as Laetrile, but used in Mexico simply as crushed apricot pits, without boiling the seeds and turning them to ethanol, which then produces benzaldehyde. You can also find the tampered-with version as laevomandelonitrile, the man-made version of B17, and amygdalin, the natural version of B17. According to the National Cancer Society, Laetrile is staggeringly lethal, and even makes cancer tumors grow larger. 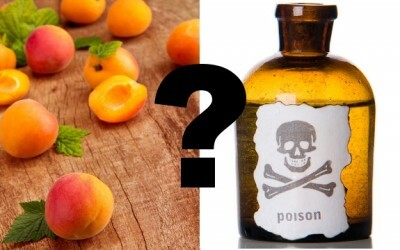 The US government has made B17 downright illegal, so why are many naturalists saying apricot seeds, which are naturally full of vitamin B17, are extremely effective at curing cancer? And how can something be toxic, if it naturally occurs in dozens of other foods like soybeans, mung bean sprouts, hundreds of vegetables, wild-berries, Oregon grapes, and cassava, a tropical sweet potato? 1. Laetrile stopped metastasis (the spreading of cancer) in mice. 2. It improved their general health. 3. It inhibited the growth of small tumors. 4. It provided relief from pain. 5. It acted as a cancer prevention. Other supporters of B17 who continued the research started by Sloan-Kettering say Vitamin B17 is definitely a cancer-treatment and preventative. Dr. Manuel T. Navarro, and Robert Bradford of the Committee of Freedom of Choice are among them. Is Vitamin B17 another great natural cancer treatment that the pharmaceutical companies silenced since the C-word is big business, or is it truly a poisonous substance that can kill us and make our cancer worse. With the government’s track record of late, like calling walnuts illegal drugs, it would probably be best for you to do your own research and decide what you believe. Common Names: Apricot pits, vitamin B17, mandelonitrile-beta-glucuronide (semi-synthetic), mandelonitrile beta-D-gentiobioside (natural product), laevorotatory, mandelonitrile, and prunasin. Brand Names: Laetrile®, Amigdalina, NovoDalin B17. “In 1978, the National Cancer Institute conducted a case study, soliciting information from 400,000 medical professionals. Data derived from this case study showed that only 93 out of 75,000 patients who had taken vitamin B-17 reported any improvement. No evidence of anti-cancer or anti-tumor benefits has been found in 20 years of scientific testing on animals, according to the American Cancer Society, which also cites a clinical trial conducted in 1981 that showed no anti-cancer benefit of vitamin B-17.” And because B-17 comes from fruit pits, it is also a source/chance or consuming cyanide, which is naturally found in fruit pits too . . . I suspect you are connected to the Cancer Conspiracy. The Pharmaceutical industry is surviving on borrowed time, they have been hiding natural cures for a long time… the internet has freed us and it will be there downfall. Greedy scumbags. Great video! I find it absolutely sickening how sites say that “B17 is lethal” and can even “cause tumors to grow larger” and all of this nonsense, when it has been shown, and proven as with the video above, etc., that it’s actually a cancer-destroyer! It’s obvious that they have had a ‘cure’ for cancer for many, many years now, just like with HIV/AIDS (which I believe was man-made; that’s my personal view, based on research), but Big Pharma is a well-oiled, money-making machine, and God forbid if people ‘find out’ what NATURAL REMEDIES can do! The thing about it, though, is the age we live in–the Information Age–it’s becoming more and more known, thanks to truth-tellers and whistleblowers and people that LOVE HUMANITY and LOVE LIFE that get the information out, that are involved in helping others, etc. You are obviously in on the big pharma / AMA / blue cross financial conspiracy. I hope they are paying you well to enhance their profits. Expecting the US government and the ACS to tell you the truth is like putting a Fox in charge of your hen house and trusting him to give you an accurate count of chickens every night. B17 is also found in flax seeds and apple seeds, and in many other grasses and seeds. Turkey was the worst hit by Chernobyl, California by Fukushima radiation. Do not source your apricots from either. I've been eating ten apricot pits per day for three or four years (along with vitamin D, selenium, curry powder, and other vitamins) and the alleged cyanide has had no noticeable effect on me. I can't prove that this regimen has prevented cancer, but it doesn't seem to have harmed me. Vitamin B17 is a natural cyanide-containing compound that gives up its cyanide content only in the presence of a particular enzyme group called beta glucosidase or glucuronidase. Miraculously, this enzyme group is found almost exclusively in cancer cells. If found elsewhere in the body, it is accompanied by greater quantities of another enzyme, rhodanese, which has the ability to disable the cyanide and convert it into completely harmless substances. Cancer tissues do not have this protecting enzyme. So, according to past scientific knowledge, cancer cells are faced with a double threat: the presence of one enzyme exposing them to cyanide, while the absence of another enzyme found in all other normal cells results in the cancer's failure to detoxify itself. Leave it to nature to provide a form of cyanide that can naturally destroy a cancer cell. The cancer cells that are unable to withstand the cyanide are destroyed, while the non-cancerous cells are not threatened by the cyanide, and, therefore, remain unharmed. Never underestimate the body's potential!